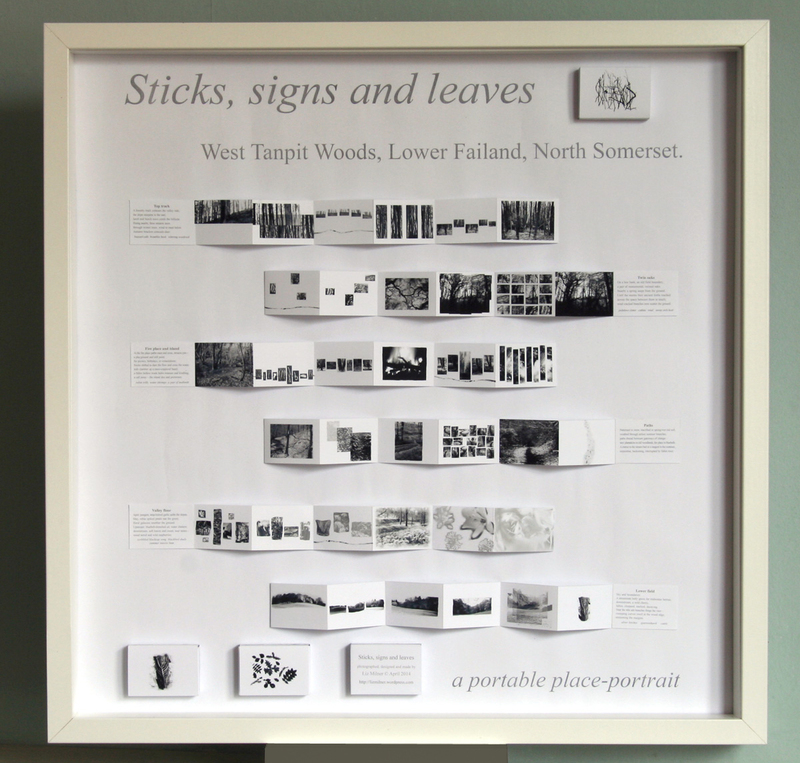 I went to the opening of Fringe Arts Bath last night (masses of work to see across the city) where my ‘portable place portrait’ – Sticks, signs and leaves was included in a show called Out of the Box, put together by the charming Tom Buchanan and Amy Douglas. After such a long time developing this piece (see previous posts here and here) it’s great to have it on display at last, and I’m delighted to see it amongst such fine company – there’s some really inventive, imaginative, romantic and witty box pieces in this show – other woods and trees represented in 3D paper cut outs; some homages to table-football and other micro humans; a tank with what looks like a cross between a Grimms’ fairy tale and a scientific experiment; hard-to-photograph but beautiful layered, ink-drawn landscapes in mirrored frames, and an array of tiny paper swans beneath the stars, and many more. The box form is such a versatile format and one I’ve been drawn to since childhood peepshow theatres made of shoe boxes – I had a beautiful one made for me as a Christmas present last year by my partner, see below. I came to appreciate it fully when I was lecturing on the Graphic Design course at UWE some years ago, where one of the modules I particularly enjoyed teaching on, set a brief for first year students at the the start of their course to create ‘a document’ with a theme that often had a personal element. 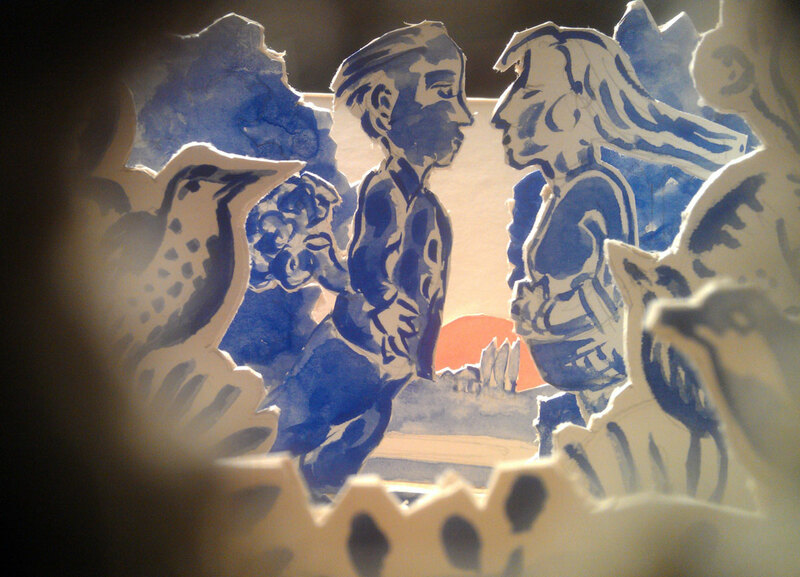 We took them to see collections of artists’ books during this period when we visited the Museum of the Book in The Hague, and the V&A (these were my first introduction to artist’s books), and introduced them to Joseph Cornell’s work. The students responses were fantastic and wide ranging and often included some very thoughtful pieces, making great use of both the constraints of the box in both design and concept, and combining this with the freedom to include 3d objects to tell their own stories. The Out of the Box exhibition, along with all the other shows and events, is on from now, 24 May to June 8th at Stall Street (opposite Roman Baths), open 11:00 am to 6:00 pm every day and it’s free as are all the other shows. This entry was posted in Artist's books, Exhibited work, Personal Arts Projects, The Woods and tagged Fringe Arts Bath, Joseph Cornell, Tom Buchanan. Bookmark the permalink.